How To Restore Your Furniture Back to Fabulous! 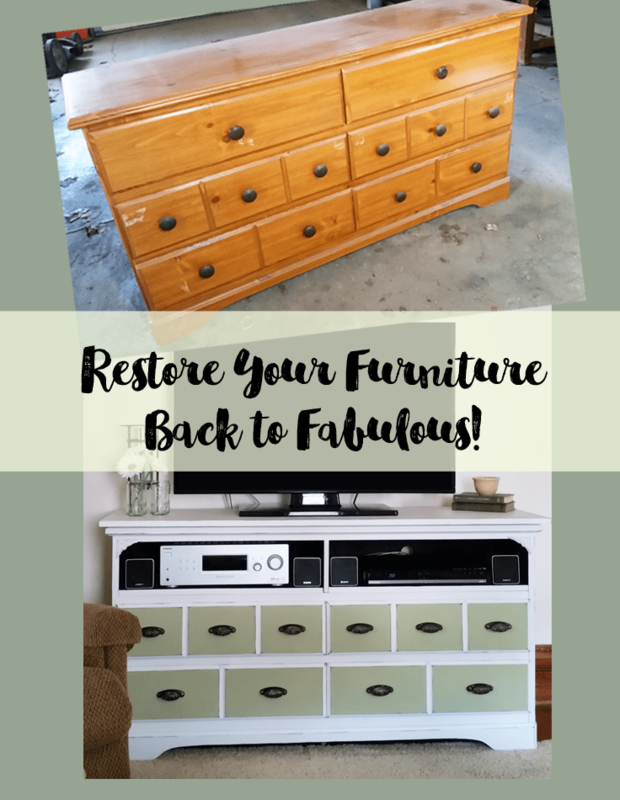 Restore Your Furniture Back to Fabulous! Hello friends! I am so excited today to be showing you how to restore your furniture back to fabulous. 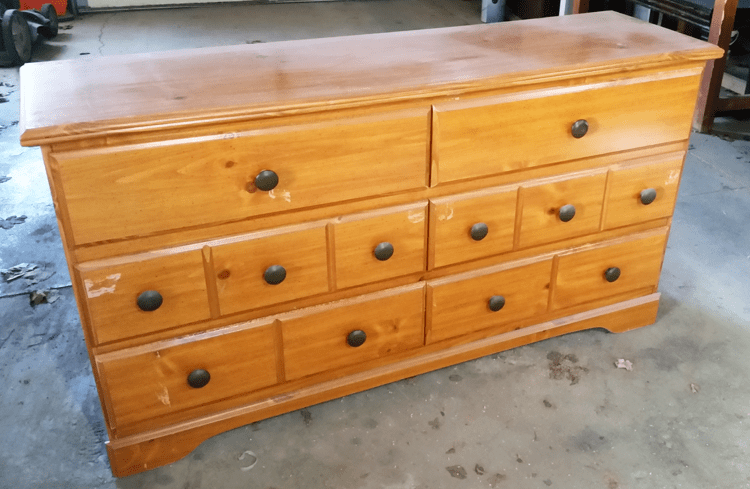 I have once again entered the Fab Furniture Flippin Contest for April and I will be showing you how we restored this dresser into a TV stand that is once again fabulous! 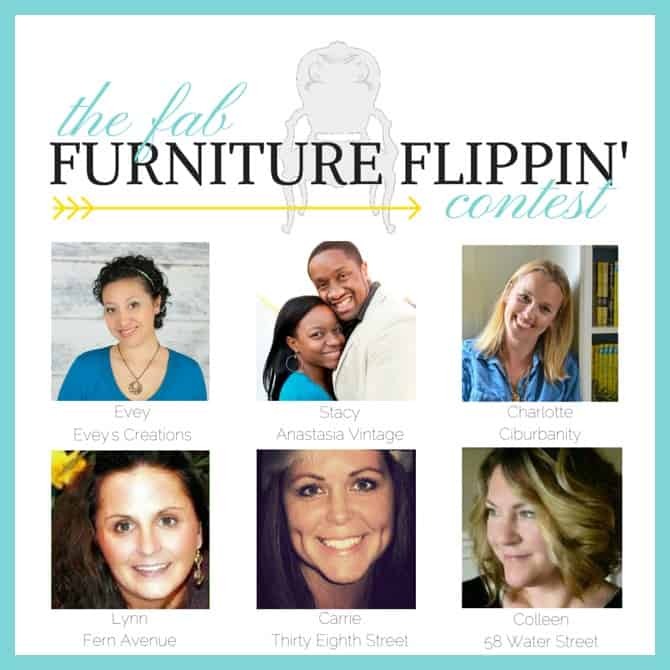 Some or all of the hosts of The Fab Furniture Flippin’ Contest receive monetary and/or product compensation from the sponsoring brand, Pure & Original, in order to complete their themed projects. Pure & Original will also provide the prize package for the contest winner. 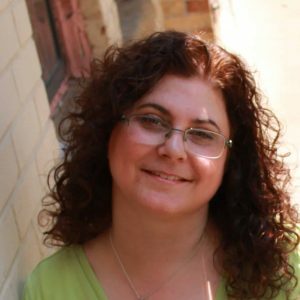 I have also included affiliate links for your convenience. 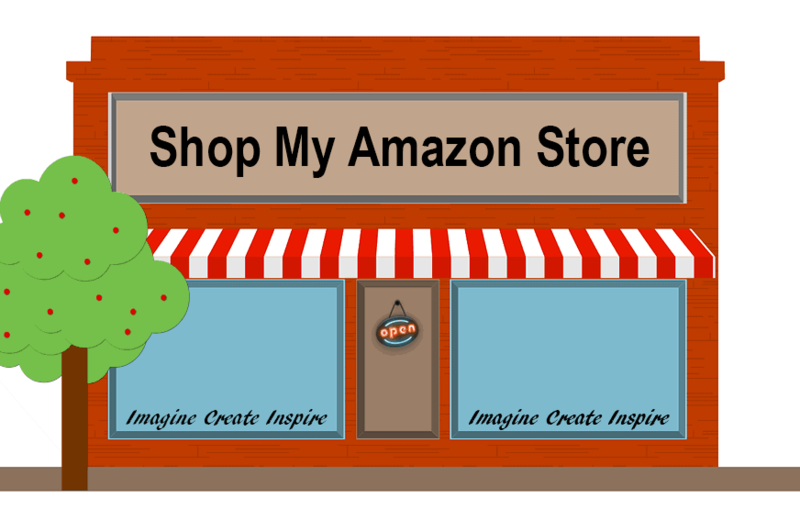 If you click on one and make a purchase I will receive a small commission at no extra charge to you. You can see my full disclosure here. When you purchase furniture it is usually something fabulous that you love. Well, after time…the fabulous wears off and things get scratched, bumped and worn. That is when you either purchase something new or you learn how to restore your furniture back to fabulous! This month’s Fab Furniture Flippin Contest theme was Pure Colors, Original Elegance and the Sponsor was Pure & Original. I had never used or even heard of Pure & Original before but…WOW…did I love their paint. 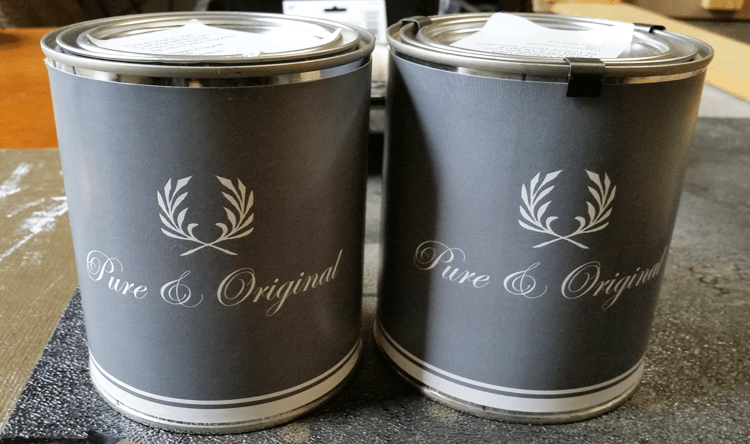 They carry paint for walls and furniture and we got to choose two quarts from the Classico line. Their paints are made in the Netherlands and are environmentally friendly. I love that about them. This is a line of beautiful chalk paints. There were, I think over 130 colors to choose from so it was not an easy decision. But I decided on Sea Moss and Casa Blanca. I am trying to lighten things up a bit in my home. Everything is dark, dark, dark. I started a few months ago by painting the dining room (now our office/crafting space) and the living room a nice creamy white and taking all of the curtains down. It has helped but now I am working on re-working or re-placing furniture with lighter pieces. First of all the paint came really fast. I was so excited when it arrived! It was a while before I used it so I was chomping at the bit to get started. This was the dresser before we started. And this was the top. Since it was going to be transformed into a TV stand we took the top drawers out and created shelves. Jeff made them out of four 1×4’s layed out and held together with two boards on the bottom. This also helped to create more structure for the piece itself. We took the back off and he created new backs (just for the shelf areas) using lath. He laid out the pieces cut to fit the space and again attached them to two pieces on the back to hold them altogether. Once the shelves and the new back pieces were made I painted them a flat black. I wanted this area to be dark to hid the wood pieces inside. A flat black is good at hiding these things. Before adding the black pieces in I sprayed a white primer on the entire piece. I have learned from experience that the white chalk paints don’t cover well and sometimes take 3 or more coats. Now the Pure and Original brand is not supposed to do that but I don’t even take the chance anymore. It is just so much easier to prime first. Plus then I have more of this paint for later! That is a win, win in my book. After priming the pieces we brought it inside for the good paint. It was cold in the garage and I was much happier painting inside. If anyone needs to trap cats this is a good way to do it. Here is the piece with the beautiful Casa Blanca paint. And with the new top! I LOVE the new top. Jeff used really nice 1×4’s on the top and sanded them really well. It is smooth and beautiful. I used two coats of the Case Blanca. Then I stared the drawers. I wanted them to look like small, individual drawers even though they aren’t. I painted the Sea Moss just onto the front panels. This took 2 – 3 coats for a really nice finish. Then when this was all dry I used my black Powder Puff ink pad from Quick Quotes (I am a rubber stamper/card maker/scrapbooker) and added some distressing. It is a lot like dry brushing only with ink. It really added a great dimension to the paint and I really like it. I added a clear creme wax over the top and buffed it a little to a slight sheen. You do not need to add a wax sealer to this paint and I almost didn’t but with the black ink I thought I should. Even though the matte finish was beautiful, I still like a little sheen. The drawer pulls were purchased at a thrift store. We got an entire bag of these (about 30 of them) for just over $4. Such a score. This is how they looked originally. I learned a trick from Christy at Confessions of a Serial DIYer to add some vaseline then spray the piece. When the paint is dry you can wipe off the paint where the vaseline is to reveal a fun, distressed look. I used metallic Oil Rubbed Bronze spray paint then revealed the finish below. What do you think? I am in love with this piece! It makes the entire room look different. Lizzie is trying to see what is going on. You may want to wander from page to page on their sites. Both are lovely! If you are interested in joining future Fab Furniture Flippin Contests you should email info@fabfurnitureflippincontest.com for more information! 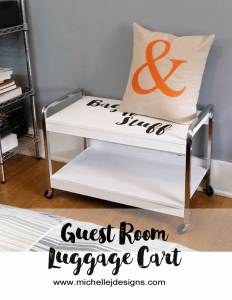 I always have fun time and am challenged each month with a great furniture flip! Thanks so much for stopping by! 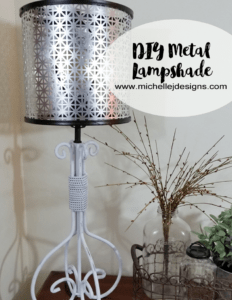 I hope this post will inspire you to restore your furniture back to fabulous. If you like this post please share with all of your friends and if you like enough to pin…here you go! 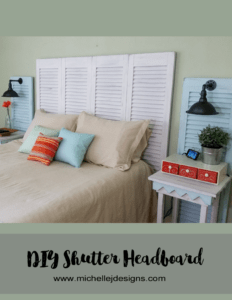 You may also like to visit my DIY project gallery for more furniture restore projects! Carolann @ Sassy Townhouse Living took a beat up vanity from Tragic to Magic! Heather @ Daily DIY Life transformed an outdated table into an office desk! Anj @ Making My Apartment a Home really outdid herself with a china hutch re-vamp. 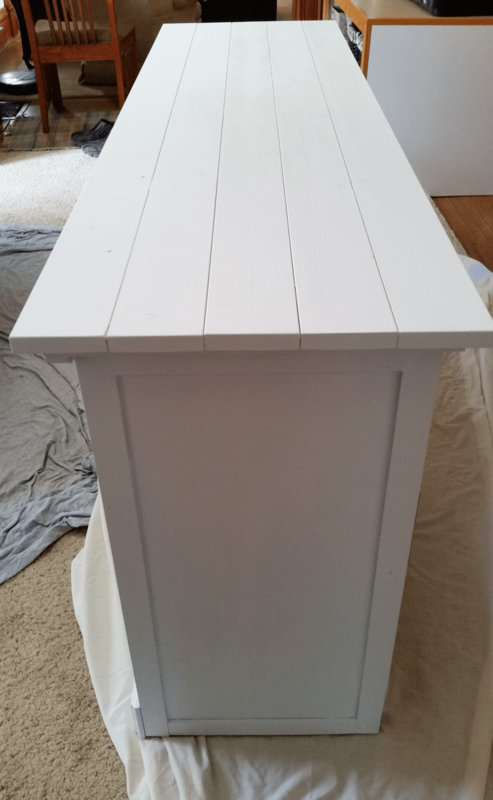 Sue @ Housekaboodle repainted an old telephone table that has been in her family for a long time. I am very excited that I was featured at The Talk Of the Town Link Party! 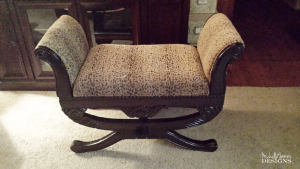 How to Tackle Your First Upholstery Project…and live through it! 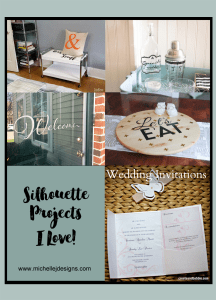 Silhouette Projects That I Love! It’s beautiful Michelle! You knocked it out of the park! I love the colors you chose! Thanks Michelle! I love green and have it sprinkled all over my home. I can’t wait to paint more things with the Pure & Original I got. I really love it. What a beautiful transformation Michelle! 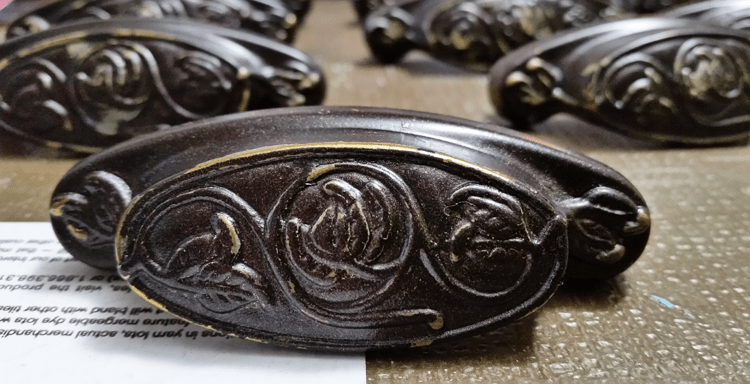 This piece came out lovely and looks like it has always belonged in your house. I am in love with the Pure & Original paint and plan to use it to liven up the new house. Thanks for sharing your wonderful project with us. It really came out perfect! Thanks so much Heather. I can’t wait to see what you do in your new home. I am thrilled for you and your new adventure. I appreciate you stopping by! Thank you Susie! I really do love it. 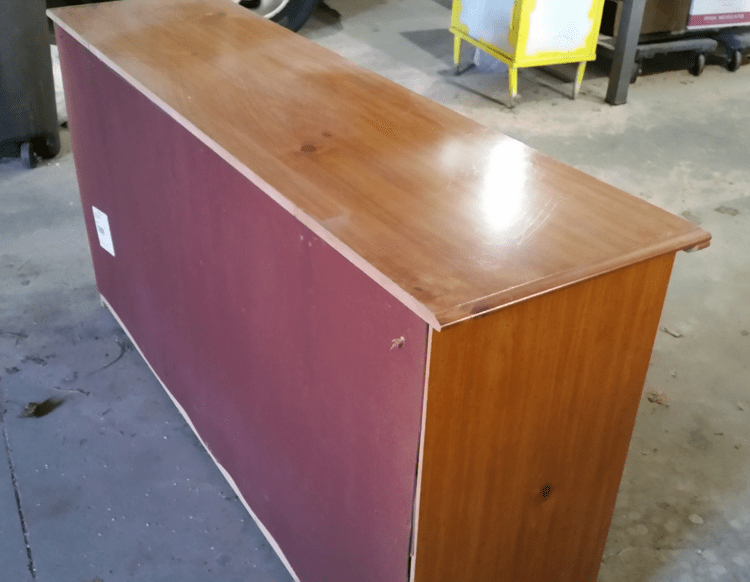 The previous tv stand was so generic and dark. I really did not know how much I disliked it until this one took its place! Thanks for stopping by! Great repurposing! That doesn’t even look like the same boring piece. 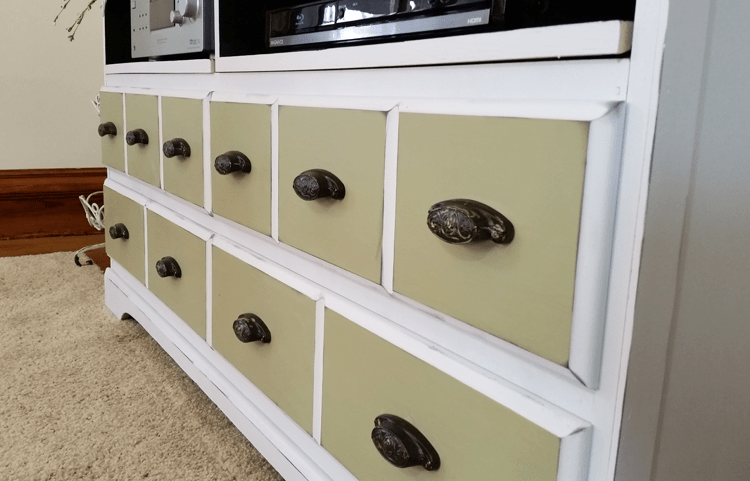 I love how you painted the drawers to give them more depth and dimension. Thanks Tammy! I love that it looks like individual drawers but they are not. But you are right, the second colors helps to create some interest. Thanks for stopping by! Awesome flip! 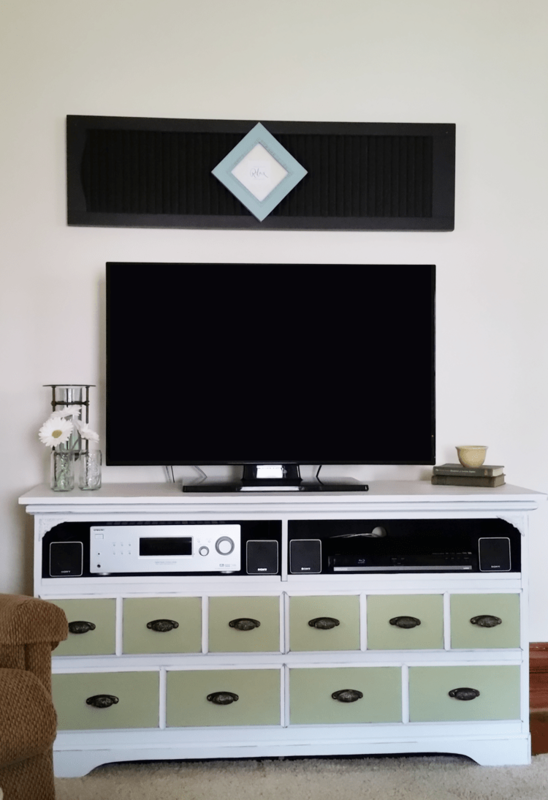 Love the top, the drawer pulls and the shelf you created. Grear color combo, too. Thank you Susie! I just cannot believe the difference it makes in the room. I am so happy with the result. I appreciate the comment! 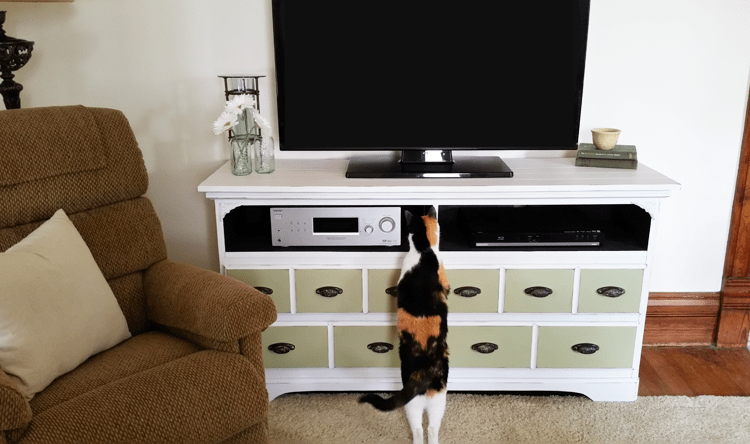 Love your new TV stand Michelle. This is very much like one that I would like to do someday. Amazing knobs and colors that brighten up the room and I like your tip of priming first too. Oh Sue I would love to see your dresser/tv stand too! Jeff had to do some work but your handy hubby could do the same. I am in love with the final result! Thanks so much Erin. I appreciate you stopping by and I am glad you like it! Hi Anj! No problem. I love your china hutch and I think everyone should see it. Thanks for stopping and I am glad you like my tv cabinet. 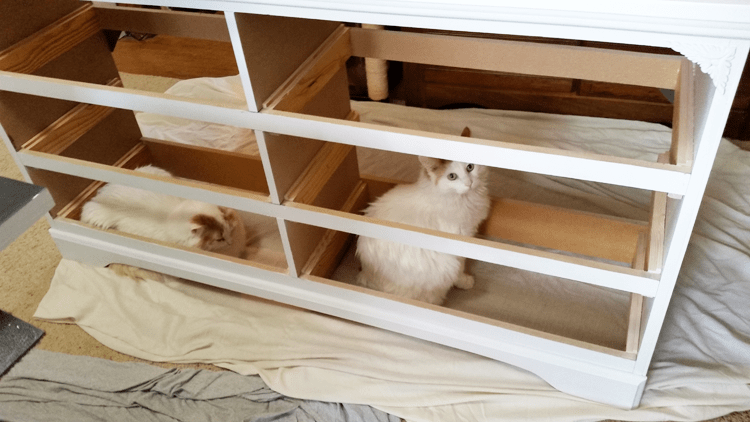 The cats are always curious when I paint or sew. LOL! 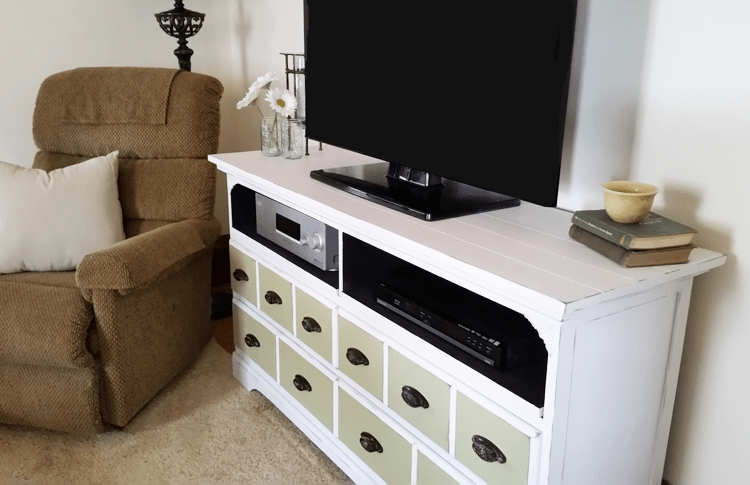 Love how your dresser/tv stand turned out. Two color combo is very nice looking. Dressers sure make nice tv stands don’t they? And there seem to be several old dressers out in thrift stores. 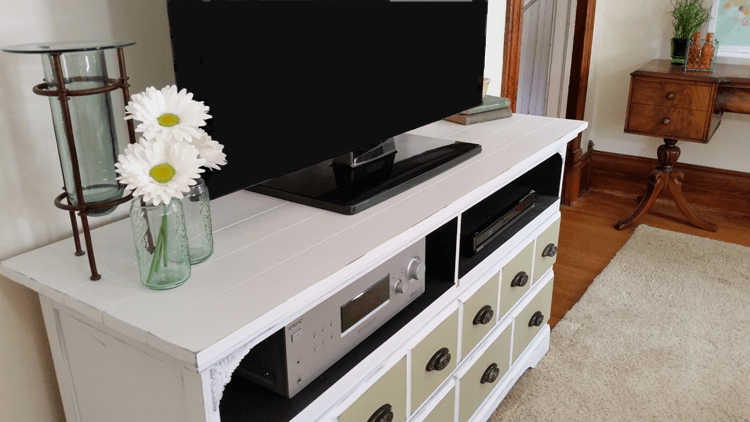 We recently made (new to us) tv stand, found sturdy 6 drawer dresser at our local thrift store for $20. But I had more in mind than hubs did to change it to what I wanted. 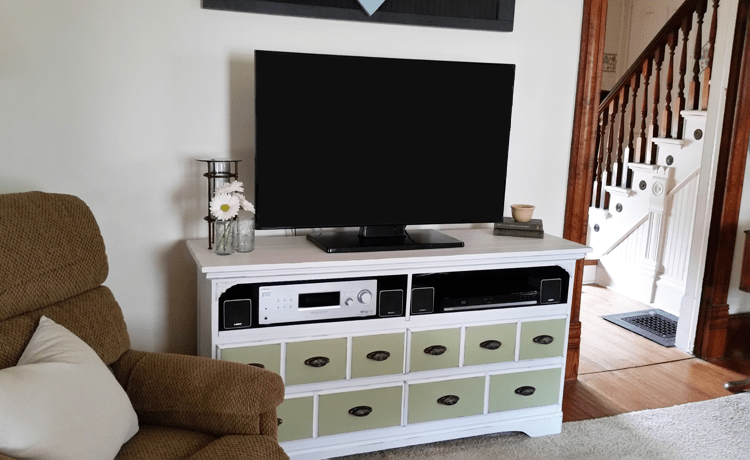 Had to talk hubs into putting sturdy casters on it, ended up getting 3″ casters to be sure strong enuf to support our new 50″ tv and things stored in last 4 drawers below shelf for dvd player. Hubs made strong shelf where two top drawers had been. He had to do some shoring up in dresser for stability. Another reason I wanted to put casters on stand, moving it in room with carpet. Makes it much easier on two older people not so strong as they were. I tend to move furniture out from wall to clean also, trying to think ahead. Our living room tended to be darker so wanted to lighten up tv stand, had dark one that was much lower. Our l/r is not big so we painted stand same light gray as walls, it almost disappears and no more big dark pc. in room. Have thought of painting fronts of drawers slightly darker gray to give some definition to piece. Wish had painted top darker gray. Did put new knobs on drawers found at 1/2 price in Hobby lobby. Not lucky like you with your wonderful thrift store find but knobs look nice. Was so glad to see your great looking rehabbed dresser. Thank you so much. 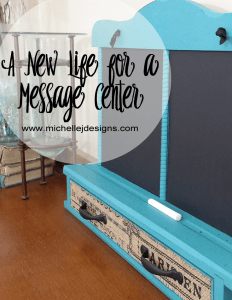 I do love it and I have to talk my husband into most things I need done with my projects. He hates to paint but hey…I can do that myself. LOL! I should be putting casters on everything too. That is a great idea for cleaning and moving furniture around. You are a smart person! I love the knobs at Hobby Lobby. I could spend a long time just looking in that section. 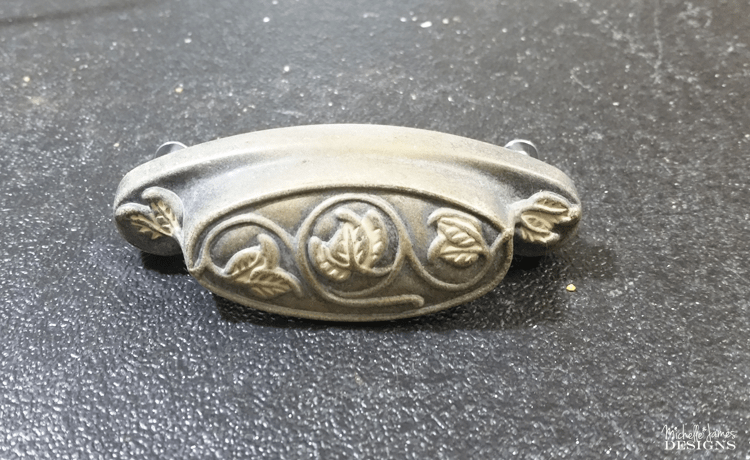 We did come out nicely on the drawer pulls. My husband called me from the store, sent a pic and said, do you want these? I said YES!!!! Thanks so much for the comments I appreciate it very much! Love how you added the little trim pieces to the open shelves, adds a nice touch! Great transformation, It really has the feel of a refigured apothecary cabinet with the drawer pulls. Thank you Brenda. We actually put those decorative scrolly things on the corners to hide a small piece of wood that was there for the previous drawers but they ended up adding a little bit of fun to it. Thanks for stopping by! Great job turning that drb dresser into a fab dresser. ThanK you. I appreciate it. The paint was great and my husband was a huge help. We love it now. Love everything about this project…the handles, the colors, the distressing! Nice job! Thank you so much. I love the end result and it makes me smile everytime I see it. ThAnka for stopping by! Very nice! Your little helpers cracked me up. Yes they are “helpers” all right! They sure do think they are helping though. Thanks so much for your kind words and thanks for stopping by! I know right? We sure did get a bargain. I love them too. Sometimes bags of these things can be hideous! LOL! Thanks so much for stopping and I am glad you love the new top on the tv stand. I knew exactly what I wanted. I would’ve never thought to add the wood pieces to the top. I love how it changed the look and the distressing is perfect! Thank you Meghan. Ever since we added wood to the top of the the Guest Room Bedside tables I want to add it to the top of everything. LOL! Thanks so much for stopping by! Thank you! I am excited that you will share this for me! I appreciate it. Thanks for stopping by.